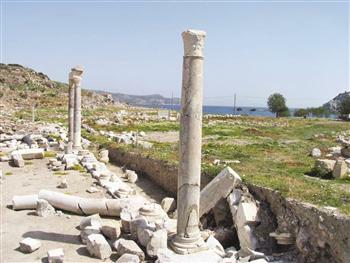 Excavation has begun again after a five-year hiatus at the Tholos Mausoleum in the ancient city of Knidos, located in the modern town of Datça, Muğla province, revealing clues in a case of theft dating back 1,800 years. Excavation work at the Tholos Mausoleum in the 2012 season has discovered that some items from the grave were stolen or damaged by ancient grave robbers. The theft was detected by archaeologists from Selçuk University, revealing that grave robbers existed even 1,800 years ago. “We found that ancient robbers were quicker to rob graves than present-day ones. Grave robbers robbed the mausoleum 350 years after the burial of the first owners of the graves, in the 4th century B.C. We found a candle belonging to the grave robbers, which they dropped in their rush to escape. We believe they escaped in a hurry and dropped a 1-millimeter golden ornament from among the stolen valuables,” Dr. Ertekin Doksanaltı said. The Dionysos Temple site consists of an entrance gate (propylon) and a columned gallery. The columns will be erected as part of ongoing substructure work in 2012. Some 70,000 domestic and foreign tourists have visited Knidos in the past two months, and landscaping at the site is still in progress. “Some ornamented blocks from the site, including those that formed the structure of the stoa [portico], are being classified and prepared for future restoration,” Doksanaltı said. 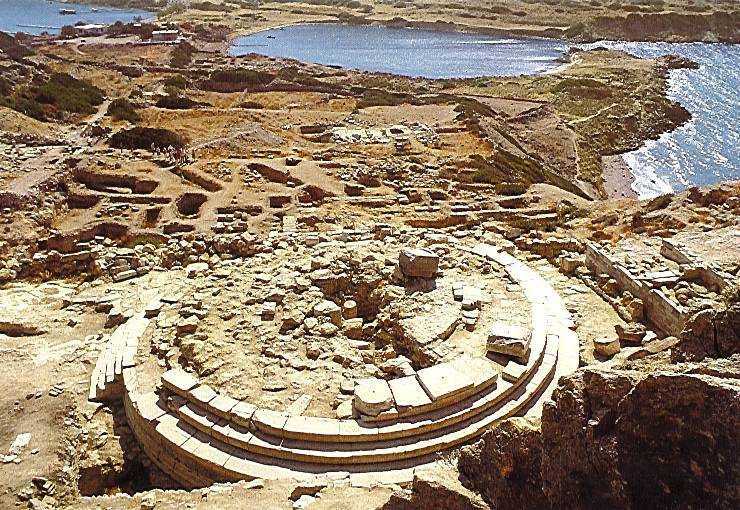 Knidos was built partly on the mainland and partly on the Island of Triopion or Cape Krio. There is debate as to whether to classify it as an island or a cape, because in ancient times it was connected to the mainland by a causeway and bridge.